Can I just write *shakes head* here and be done with it? The Reds were swept yesterday by the Pittsburgh Pirates. Friday they got a shaky start from Mike Leake, which maybe isn’t so surprising after all. 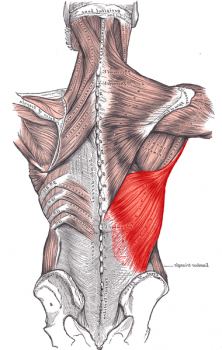 Saturday they lost Johnny Cueto to what is still a mystery injury. Yesterday it was another of those hit-the-wall kinds of games. Mat Latos was rocking a shut-out when he entered the seventh inning. Then Michael McKenry knocked a solo shot over the wall to lead off the inning. Two outs and two baserunners and another run later, Latos is out and it’s up to Logan Ondrusek. Ondrusek, though, couldn’t get out of the inning and his inherited runner to score, plus added one of his own. Not to worry! Manny Parra took over to allow the second generation of inherited runners to score. …The Reds return home to host the Phillies tonight. Bronson Arroyo (RHP, 1-1, 5.25 ERA) defends against some guy you’ve never heard of called Cliff Lee (LHP, 2-0, 1.08 ERA). First pitch at 7:10 p.m. 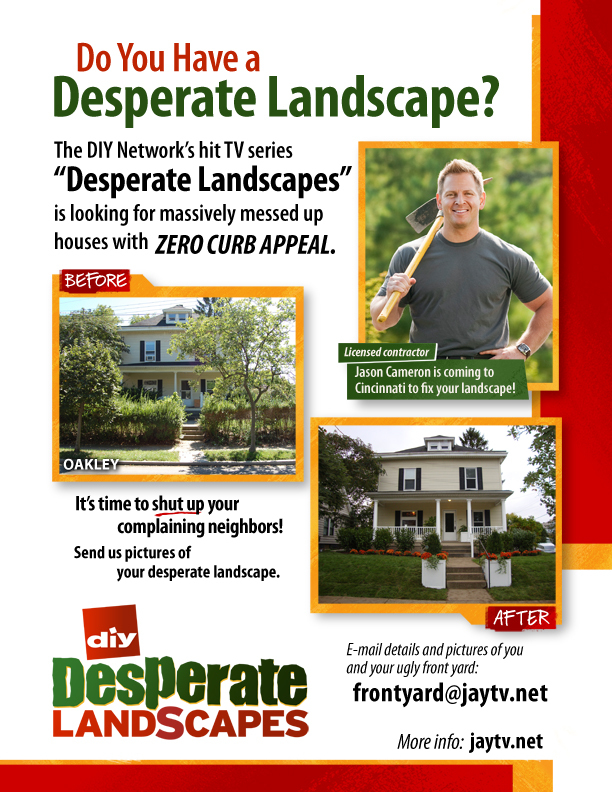 If you are in the Cincinnati area and have serious yard issues, like broken concrete, a disintegrating porch, or horrible landscaping, your yard transformation can be televised. 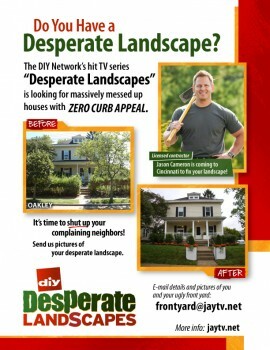 Go to www.jaytv.net and click on Desperate Landscapes to apply. You can read more about the show on DIY Network’s website. Before yesterday, the Pirates hadn’t swept the Reds in a 3-game series since April 2010.